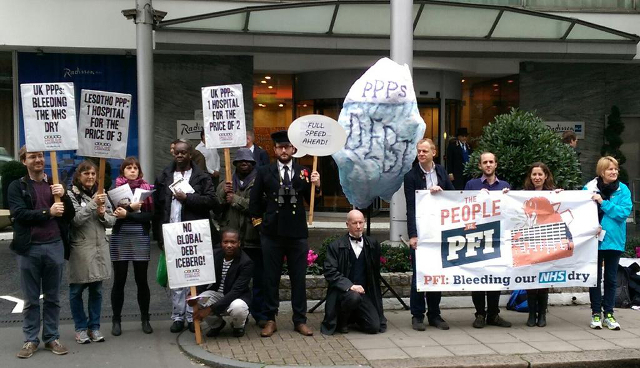 Campaigners protested outside a conference in London this morning to warn of the dangers to government finances of public-private partnerships. The campaigners placed a large ‘debt iceberg’ near the entrance to the conference to illustrate the hidden financial risk of schemes such as the UK’s Private Finance Initiative. The Africa Public-Private Partnerships conference aims to promote schemes similar to the UK’s Private Finance Initiative, which has saddled NHS Trusts with huge debts. The UK National Audit Office says that hospitals built under the Private Finance Initiative cost UK taxpayers twice the amount that would have been paid if the government had built them itself, not including extra costs to pay private company profits. In Lesotho in southern Africa, the Queen Mahamoto Hospital built through a scheme similar to the Private Finance Initiative is costing the Lesotho government three times more than the previous hospital, whilst private companies involved get a 25% annual profit on their investment. Between 2002 and 2013, the UK gave $663 million out of its aid budget to the Private Infrastructure Development Group, itself a PPP, which exists solely to support Public-Private Partnerships in infrastructure. A recent study by the World Bank’s Independent Evaluation Group found that of 442 Public Private Partnerships supported by the World Bank, assessment of their impact on poverty were conducted for just nine of them (2%) and of their fiscal impact for just 12 (3%). According to Maximilien Queyranne from the IMF Fiscal Affairs Department, the fiscal risks of PPPs are “potentially large” because they can be used to “move spending off budget and bypass spending controls” and “move debt off balance sheet and create contingent and future liabilities”. He also warns that they “reduce budget flexibility in the long term”.